We were so excited to be asked by Exquisite Weddings Magazine to design a tabletop for their next print issue and are thrilled to share the photos here! We were pared with the amazing Blush Botanicals–two girls we totally heart–and invited Nic Roc Design (paper products) and Hall Vintage to be involved as well. 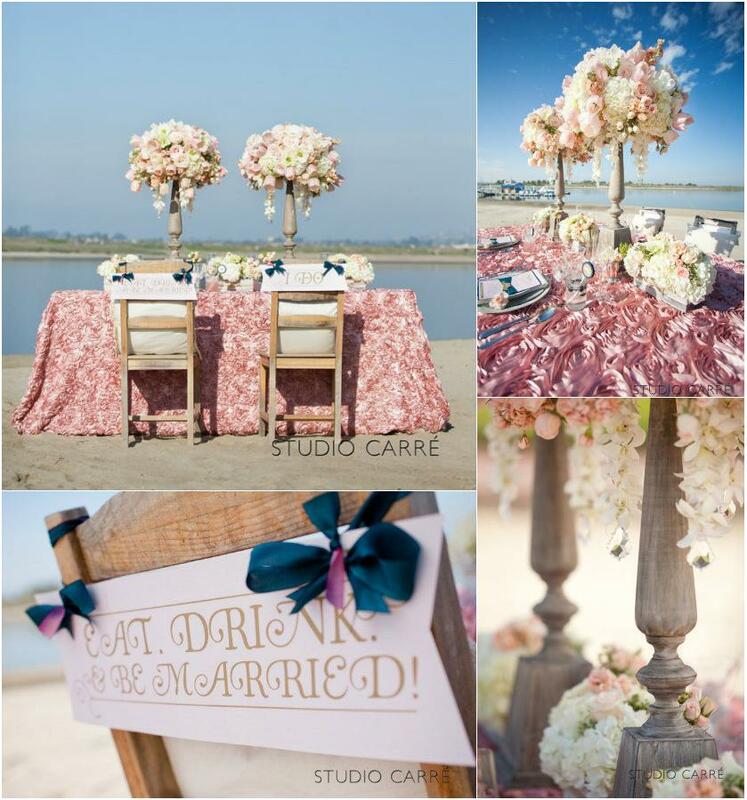 La Tavola provided the beautiful linen and the Hilton on Mission Bay provided the back drop! We wanted to create something with a little bit of whimsy and we love the result! 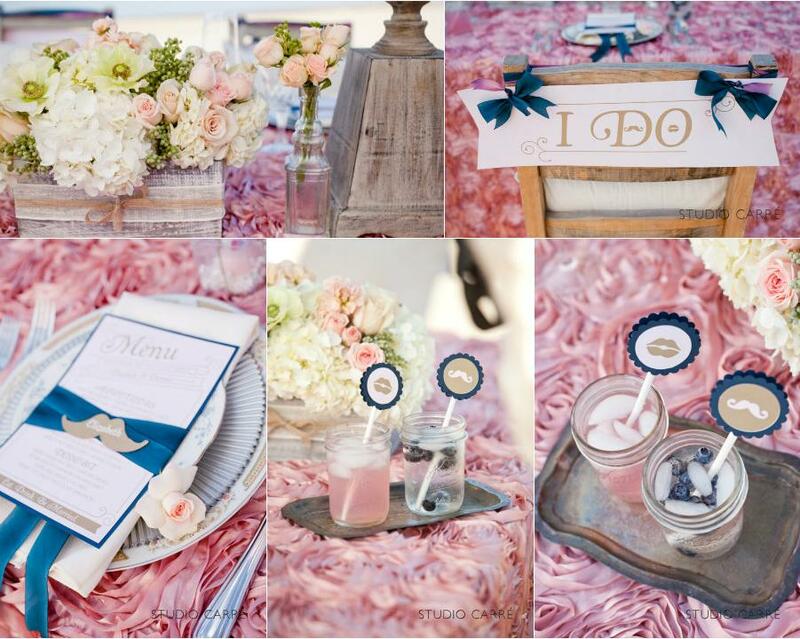 Our palatte included different shades of light pink and ivory with a dash of dark blue. If I were creating this for a real wedding, I would put the bridesmaids in dark blue and the groomsmen in a grey-blue suit with pink and ivory ties. 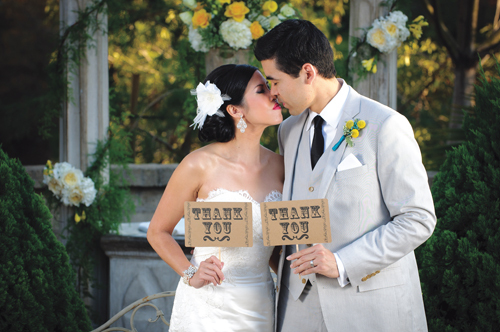 Cute signs by Nic Roc and look at the sweet little favors created by Cake Ball Love. Hall Vintage provided the wood chairs as well as all the glassware, flatware, and china. Nic Roc did the menus and stir sticks. We added signature “Mr.” and “Mrs.” drinks in our color palatte of pink and dark blue. We liked adding the mustaches and lips for that look of whimsy. We’re so happy with how it all turned out! Look for the current issue of Exquisitite Weddings Magazine on newstands to see the full spread! 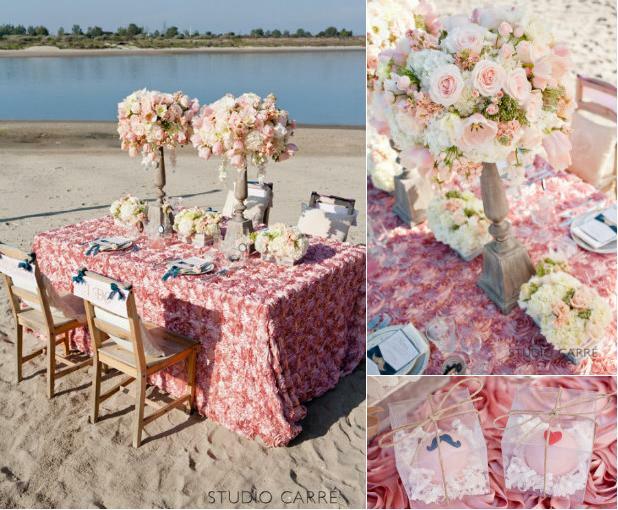 And thanks to Studio Carre Photography for the beautiful pictures!